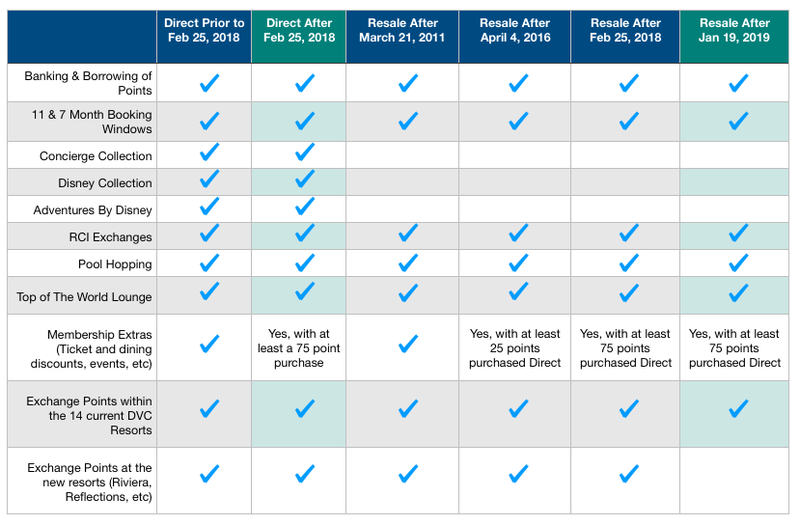 When purchasing a DVC resale contract, it’s a good idea to have a visual guide to help with understanding the differences between resale and direct purchases. Take a look at the chart below to see what is and is not included with your DVC resale purchase. Resale Policy: As of March 21, 2011, you will not be able to use the Vacation Points associated with this Ownership Interest to make reservations for the Concierge or Disney Collection options such as the Disney Cruise Line, Adventures by Disney, or select Disney resorts. Instead, your Vacation Points can be used for reservations at the 14 Disney Vacation Club resorts and for exchanges with RCI (also known as the World Collection). Further, as of April 4, 2016, you will not have access to other Disney Vacation Club Incidental Benefits (also known as Membership Extras) such as Member discounts on dining, shopping, annual passes, Member exclusive events, and certain special Member offers. Effective February 25, 2018, to be eligible for Membership Extras, Members must own and maintain a minimum of 75 Vacation Points purchased directly from Disney Vacation Development, Inc. Please refer to DVC’s Member Benefits Guide for further details. Effective January 19, 2019, only Members who purchase directly from Disney will be able to use their Vacation Points at future Disney Vacation Club Resorts—such as Disney’s Riviera Resort or Reflections – A Disney Lakeside Lodge. Resale contracts purchased for the existing 14 Disney Vacation Club Resorts will only be able to exchange Points into those 14 Resorts. Membership Extras, such as vacation options in the Disney and Concierge Collections, certain discounts, offers, and special events are incidental benefits. These incidental benefits are subject to change or termination without notice, may require the payment of a fee and cannot be combined with any other offers or promotions. Membership Extras are also subject to availability and block-out dates may apply, including high periods of demand such as Christmas and New Year’s Day. Its important to note that Membership Extras are considered incidental benefits and can be changed or removed for all owners at any time. You should not purchase an interest in the vacation ownership plan in reliance upon the continued availability or renewal or extension of these benefits. Please refer to the Membership Extras Acknowledgement and Disclosure Statement for full details. 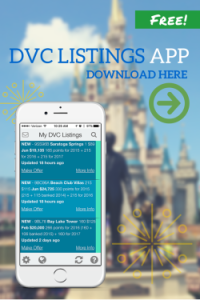 For tips on how to get some of the same or similar benefits with your resale purchase, check out our blog for ways to work around the limitations: How to get DVC benefits as a resale owner.